We are still in the middle of Summer over here so I thought to share an easy peasy and super yummy recipe for your summer evenings out: bbq bread rolls! 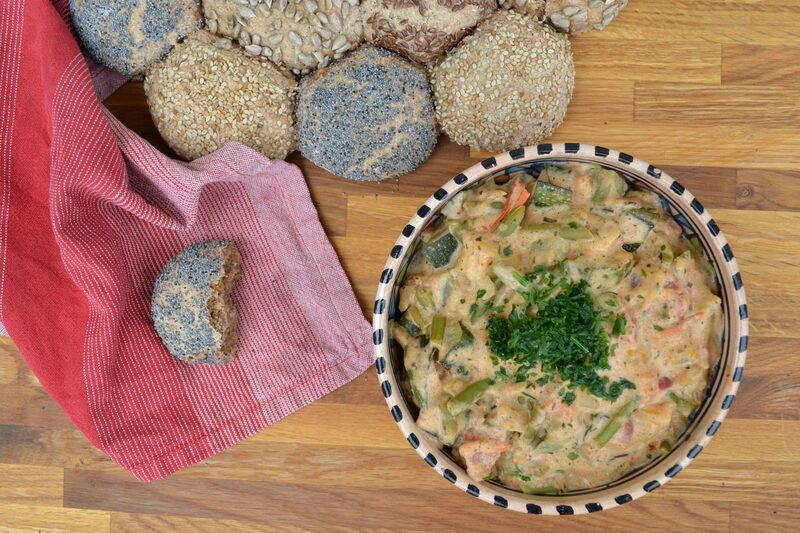 Whole grain, vegan and deliciously spicy! Who else does love summer picnics and barbeque parties? Well, I certainly do – as long as there aren’t any dead animals on the bbq! I prefer grilling veggies (especially corn), tofu, and potatoes, but my favorite part of the whole deal are all the different side dishes: salads, greens, and of course bread! This is why I thought to share the recipe for bread rolls that I spiced up with different bbq spices. They taste great as a snack just the way the are, but are even more delicous with a salad, some spread, or some veggie stew (like I posted here). 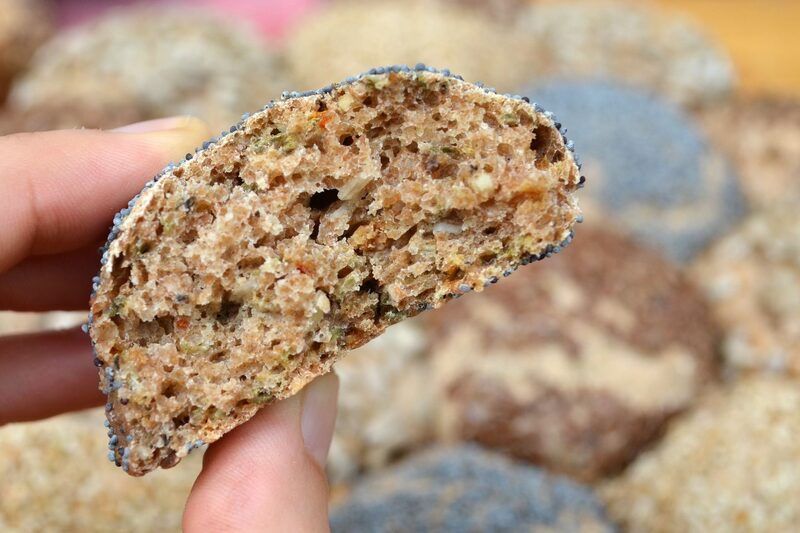 Even when you are not planning a bbq anytime soon, you will love these bread rolls. 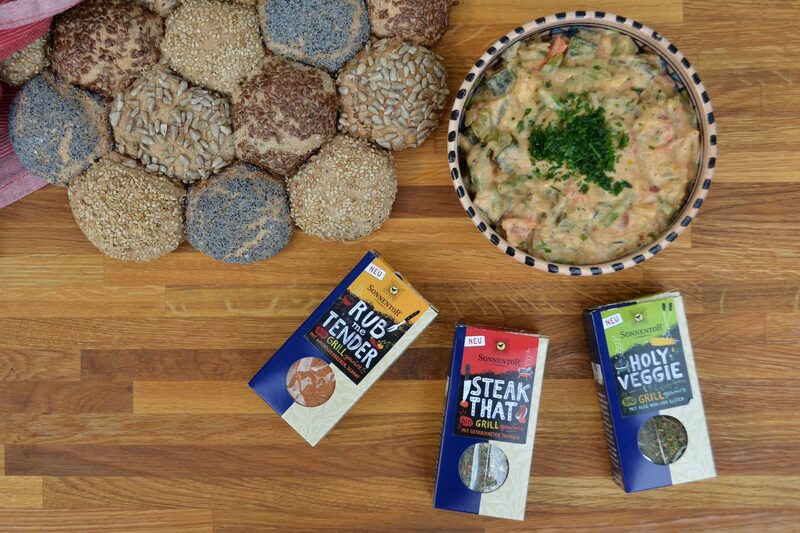 They go well for any kind of party or just for your family dinner at home. They are easy to make, look super pretty, and are absolutely yummy. For the recipe here I am using three spice blends from the Sonnentor BBQ Sixpack. I have been using the spices in that sixpack a lot this summer, especially love the smoked salt, smoked paprika and the holy veggie blend. But even those spices that are made to be for steaks go soooo well with vegan dishes. I put a ton of the steak spice in the dough of one third of the bread rolls that I made here – and those turned out to be my favorite ones (slightly hot and super good). Here we go with the recipe for 18-20 bread rolls that can be baked as single pieces or (like I did here) like a bread flower. blend the rye with the spelt flour and pour both into a bowl. Use your fingers to make a hole in the middle to add your yeast and some warm water which allows the yeast to melt. Add the rest of the water and knead the dough carefully. Cover the dough and let it sit for 20-30 minutes. Now add the plant oil and the salt and knead carefully again. Divide your dough into three parts and knead the three different spice blends into the respective dough. You should end up with three pieces of dough same size. Make three rolls out of the dough and cut the rolls into pieces of equal size. 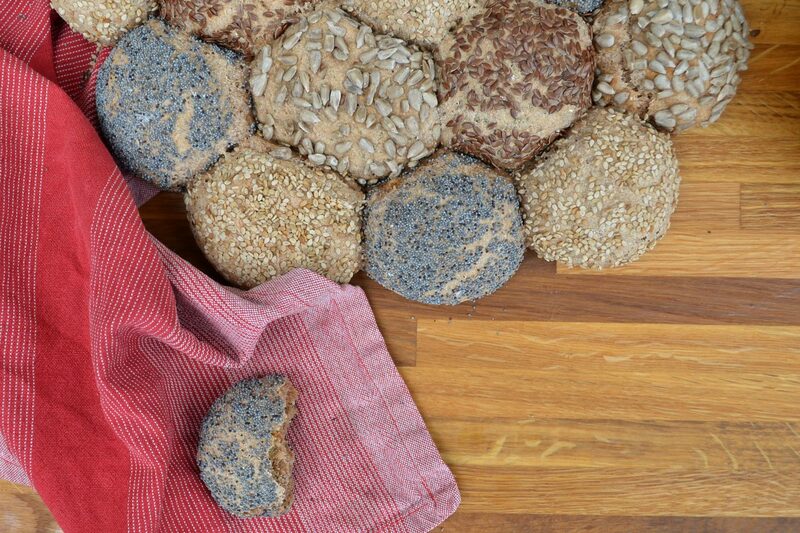 Then form the bread rolls and add the different toppings (easiest when having the seeds in a bowl and you just put the respective piece of dough in the bowl). Cover the bread rolls and let them sit for another 5-10 minutes before putting them in the oven. 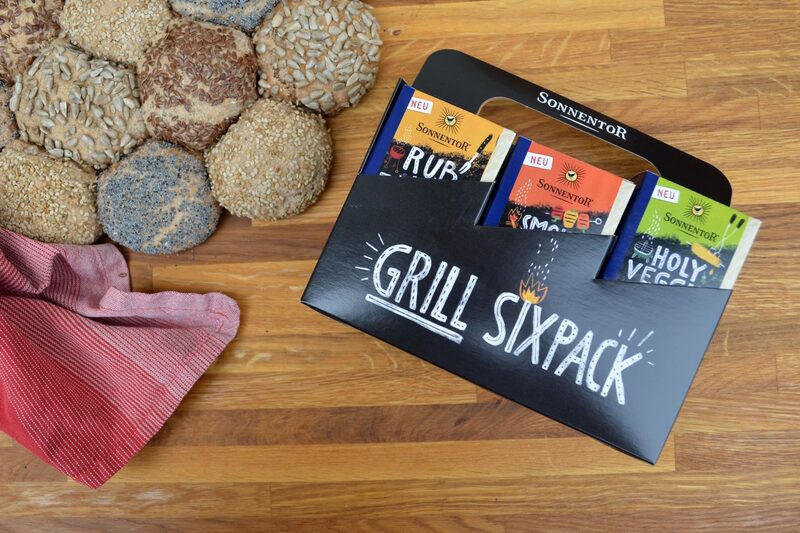 The BBQ sixpack from Sonnentor is not only a great tool for your summer kitchen, but makes as a great gift too! I loved giving it away this summer, since it’s really something basically everyone can use. The variety of spices goes all the way from a simple smokey salt, over the pretty hot Rub me Tender blend, up to the Holy Veggie blend that comes with nori seaweed and most probably will surprise you with the beyond great flavor! I loved experiencing with these spices and made loads of differnt things – added them to sauces, stews (like the one pictured here) but also marinated some tofu with the Rub me Tender blend. Oh and by the way, the veggie stew that I made here is super simply to copy: cut one onion and some garlic into pieces and put into your frying pan, add some vegetable broth and water and let simmer for a bit. Then add one zuccini (cut into small piececs) and green beans. Make a cashew cream by blending a handful of cashews with some water and add that to the pan. Finally, add some holy veggie spice blend and salt if you like. Delicious, creamy, and soooo easy to make! It’s actually my go-to meal for whatever kind of veggies I have in the house. Even when you have guests – you can NEVER go wrong with something that is covered in cashew cream 😀 It’s so delicious, everyone will love it! Now I would love to know what you think about this recipe and about adding spices to your bread for a bbq party!? And in case you try this recipe I would love to know how it turned out! These look so beautiful, and also sound delicious!